This week David Haller is back to mess up your minds in Legion, and Gorilla Grodd returns to menace The Flash! 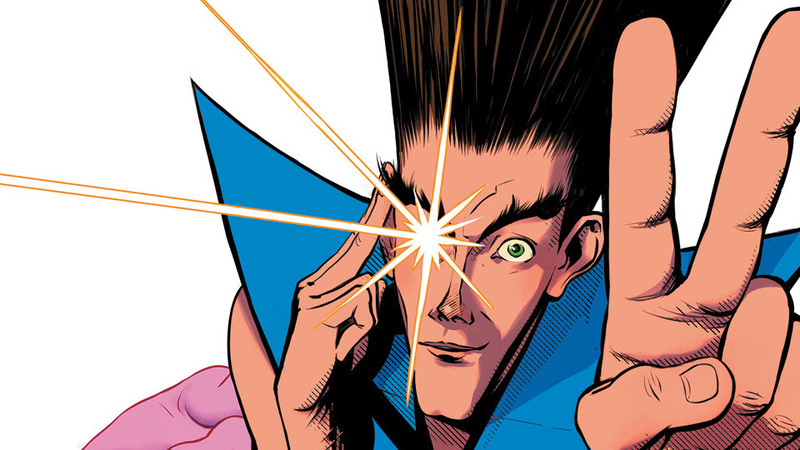 With a critical hit series on FX, it’s no surprise that Marvel would restart Legion. Focusing again on David Haller, the son of Charles Xavier, the Peter Milligan and Wilfredo Torres series doesn’t have quite the mind-bending narrative that the show has, but it’s still very entertaining. After being sent to a local hospital after a recent psychic incident, David Haller’s doctors accidentally release Lord Trauma, one of the many personalities inside of Haller’s body. Since Lord Trauma isn’t one of the more friendly personalities in Haller’s mind, it’s up to him to track down Trauma before he causes catastrophic damage to the planet. Haller’s going to need help, and he’ll find it from a psychiatrist in New York City. Peter Milligan’s script is pretty easy to get into. Whether you know of Legion through his show or his history with the X-Men, Milligan’s script does a great job of setting up the character and his many abilities in a way that doesn’t read like a recap of the character’s life. While there’s not a lot of back story on David’s Lord Trauma persona, the fact that he’s one of the “bad” personalities is good enough to get through the narrative. Wilfredo Torres handles the art for this issue, and his clean style works really well for the series. I initially was worried that his style would be too clean for the crazy sequences that come with Legion, but I was happy to find out that those concerns were all for naught, as Torres’ style works surprisingly well for these scenes. There are really no bad panels to be found in the entire issue. 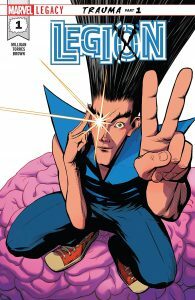 Legion #1 works as a very solid debut for the miniseries, and a pretty nice change of pace from the stuff Marvel has been putting out. Hopefully the show will give this title a boost, as Legion is one of the more underrated X-Men characters. At the very least, it seems like Milligan and Torres’ miniseries will do the character justice. For an issue touting that it’s the “700th story of The Flash”, you’d think that The Flash #39 would be a little more action packed. 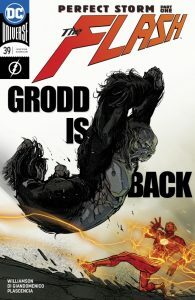 While the cover features an awesome looking image of Gorilla Grodd preparing to smash the Scarlet Speedster to bits, the Joshua Williamson and Carmine Di Giandomenico issue instead has the action take a backseat in favor of focusing on Barry and Iris’ relationship problems. Now that Iris has figured out that Barry Allen is the Flash, there’s more tension between the two than ever. After meeting her at his mother’s grave (a weird choice even though it fits in with the narrative), Barry and Iris talk out their relationship problems, leading to a fun sequence where Iris gets to find out what a day in the life of The Flash is really like. Iris gradually accepts the truth about Barry’s superhero life, and it seems like the two are ready to start up their relationship again. That is, until a group of Flash’s recent enemies makes their presence known, and they’re lead by Gorilla Grodd, who’s looking to capture the Speed Force to save his life. Joshua Williamson’s run on The Flash has been very good, so I honestly don’t blame him for this issue not living up to the hype. After all, he probably didn’t know this issue would technically be the 700th Flash story. If he did, I bet he would have penned a more action-packed issue. But even if this issue is light on the story, Williamson continues to showcase the great character work from his indie books like Birthright with this run. Williamson is able to get into the mindset of Barry Allen in a way that makes him feel like one of your closest friends, something that’s much needed for this kind of character (and for us to side with him about keeping secrets from those he loves). On the art side of things, this is definitely a strange issue for Carmine Di Giandomenico to draw. While there’s not a lot of action until the final few pages, Giandomenico is able to present some fairly dynamic panels throughout the book. His pencils elevate Williamson’s script from being just a “recap issue”, and he even gets to showcase his great character work with the simple run Barry and Iris take. He also draws a pretty killer Gorilla Grodd, something that’s highly necessary if you are going to make him a legitimate threat. While this wasn’t the action paced issue I was expecting, I’m still going to stick with The Flash. There’s some awesome potential here for the new storyline, and I’m always a sucker for Gorilla Grodd. Now that the recaps and relationship drama are out of the way, here’s hoping the rest of the storyline moves along at a faster pace (pun intended). The Best New Amazon Releases: Nanananana Arkham! Comic Reviews: Batman/Teenage Mutant Ninja Turtles and Amazing Spider-Man!